For six years Lu Yu stayed in Houmen mountain studying under the guidance of master Zou Fuzi. During this period Lu Yu often brewed tea for his teacher. He also took care of fellow students' health with his remarkable knowledge in tea and herbs that he learned while at the Longgai Monastery. Whenever time permitted between his studies Lu Yu often went to the countryside to gather tea leaves and herbs. In one of those trips Lu Yu stumbled upon a spring underneath a 6-foot round rock and the water from the spring was extremely clear and clean. When Lu Yu brewed tea with this spring water he found the tea tasted unexpectedly better than usual. From then on Lu Yu realised the importance of quality water in brewing tea. Zou Fuzi was moved by Lu Yu's obsession with tea and his skill in brewing good tea. He cleared the rock together with some of his students and dug a well around the fountainhead of that spring. In 1768 just over a thousand years later during the Qing Dynasty(1616-1911), Jingling was hit by drought and the whole city was badly in need of water. City folks found water still flowing from this well uncovered by Lu Yu and dug by Zou Fuzi. 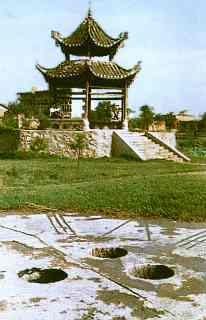 The Qing official of Jingling ordered three wells to be dug around it and a structure constructed near the wells and named it the Lu Yu Hut and the Literary Spring. In 752 Lu Yu concluded his studies, bade farewell to his guru Zou Fuzi and returned to Jingling to meet his benefactor Li Qiwu. However a year earlier Li Qiwu was reinstated and returned to the Tang capital Chang'an. The new Chief Official of Jingling now was Cui Guofu. Cui a senior official who was holding a position similar to an Education Minister of today was demoted to Jingling as a Chief Official for offending a member of the royalty. Cui Goufu was a scholar and poet well known for his magnificent 5 characters per verse short poem. After his demotion to Jingling Cui Goufu took life fairly easy. Even though Cui was many years older than Lu Yu, both men shared the same interest in tea, literature and poem. As such they became buddies soon after they met. During this period Lu Yu stayed with Cui Goufu and assisted him in his administrative tasks. The two of a kind spent much time travelling, drinking tea and writing poems and they co-authored several books on poems. This period with Cui Goufu was the growing phase for Lu Yu as a man of letters; an incubation period for Lu Yu to practise and sharpen what he learned from his guru Zou Fuzi. Cui Goufu with his vast experience and skill in literary work became a coach that provided the necessary guidance to enhance and mature Lu Yu's writing and literary skills.